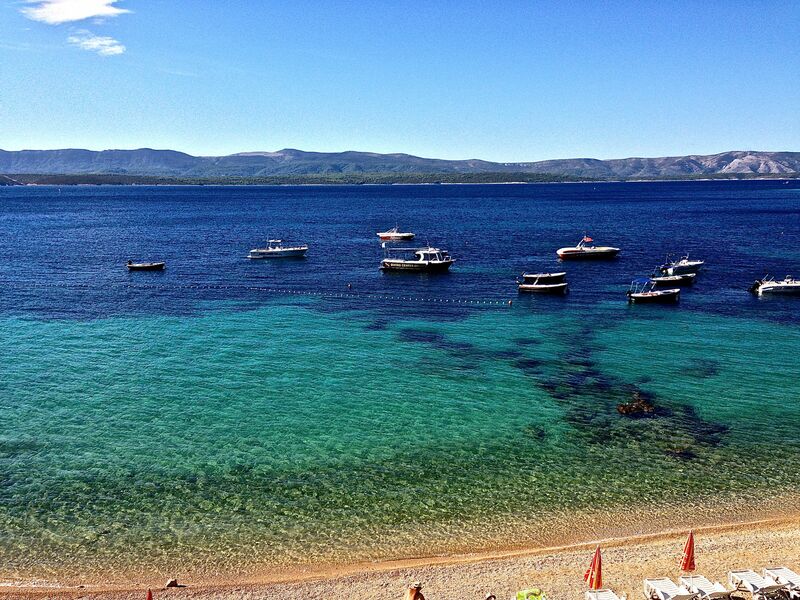 We are in Bol, Croatia. 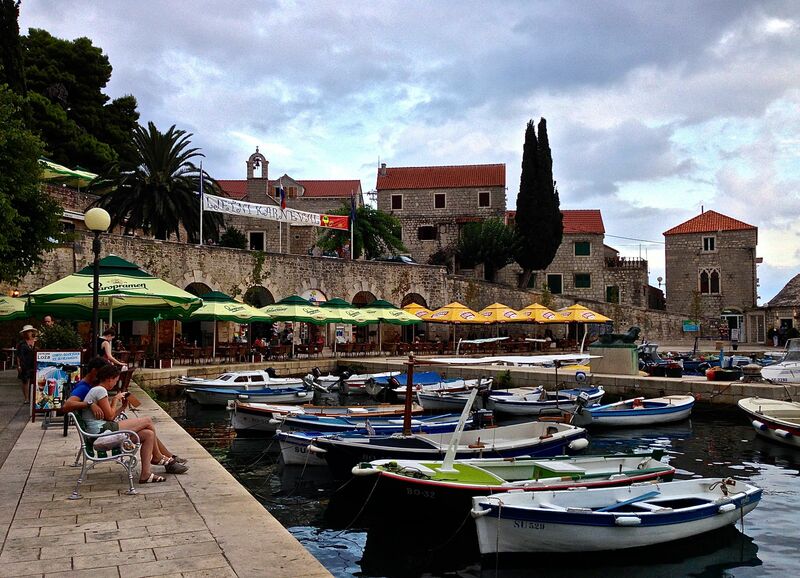 A city of 1600 on the island of Brac. 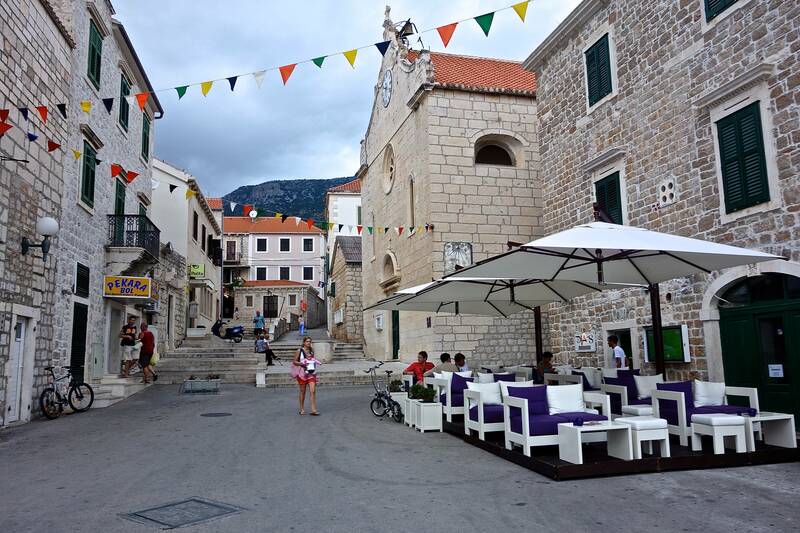 We leave today for Hvar, a town or village of 3500, on the island of Hvar, which is also in Croatia. 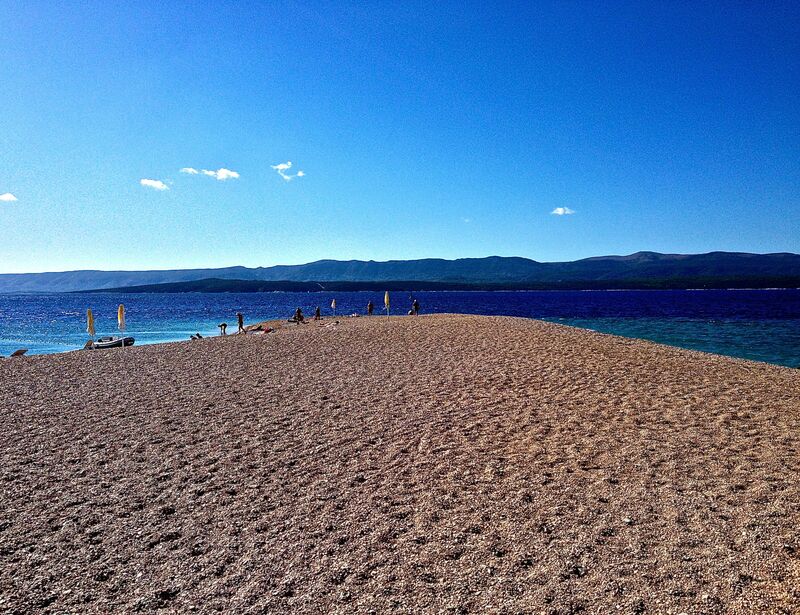 Yesterday, we spent the day on Zlatni Rat beach. It was a beautiful day, bright sunshine, 75 degrees and a steady wind to keep us cool! 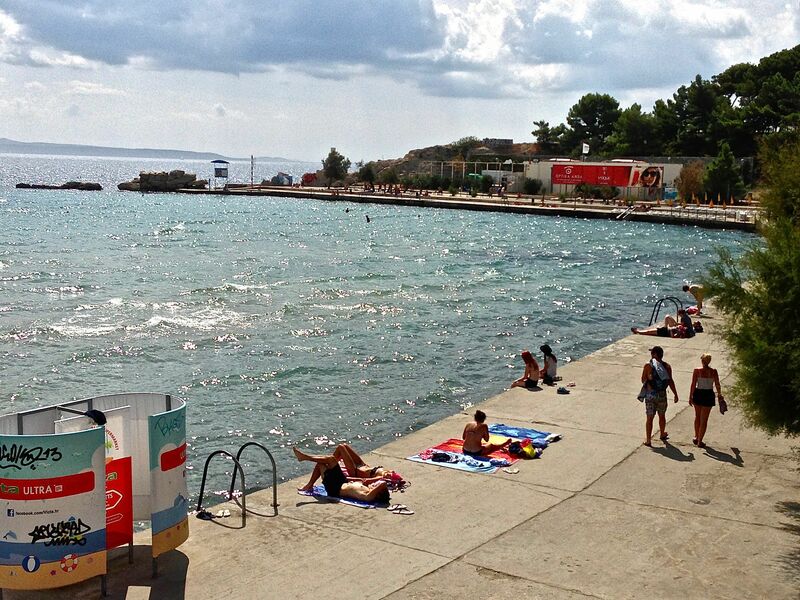 The beach is supposed to be the best in Croatia. It was made up of small pebbles, not sand, but it was beautiful. 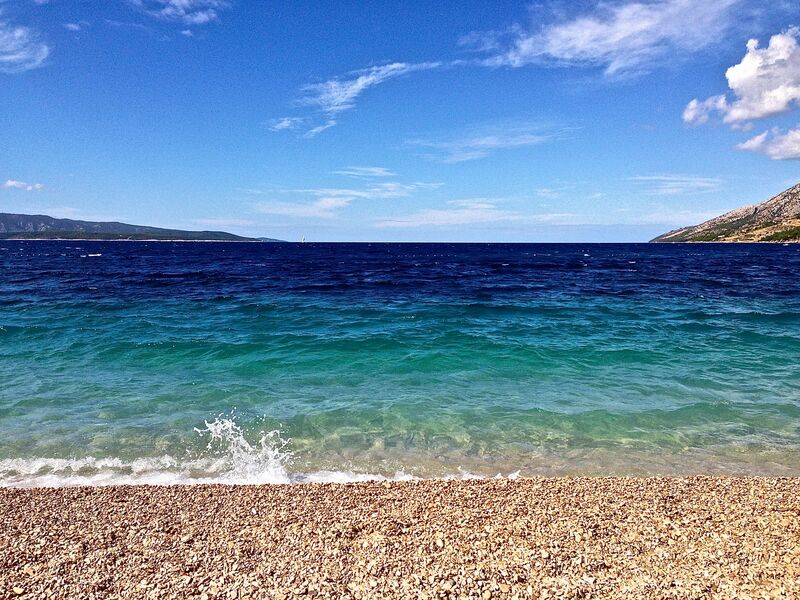 The Adriatic Sea ranges in color from green to dark blue, really lovely. 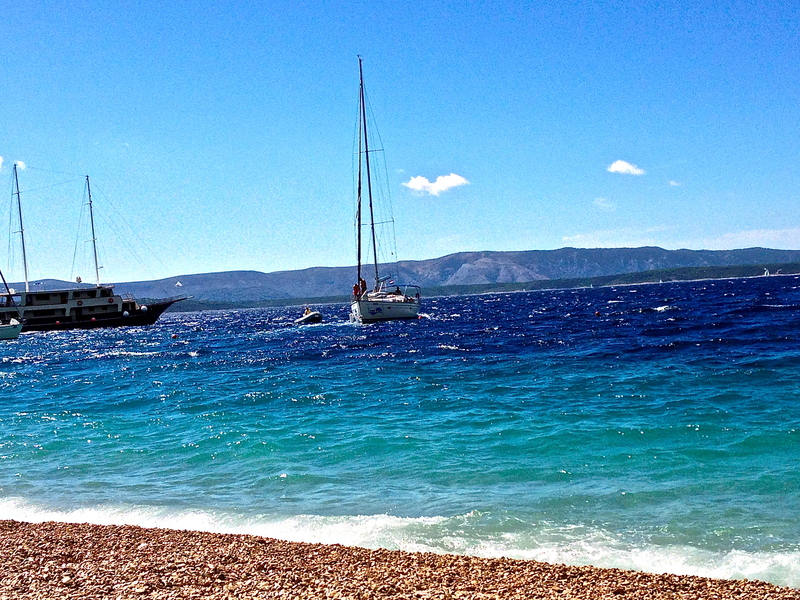 Our entertainment was watching the “amateur” yachters try to anchor off the beach. It was so funny. They entertained EVERYONE on the beach. They would pull up their half million dollar yachts right up to the floaters separating swimming areas from yachting areas, then, snag the floaties around their props. 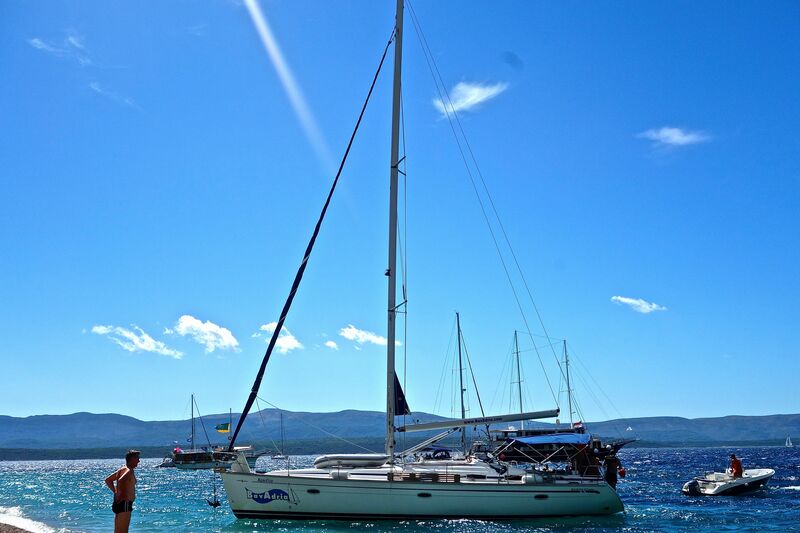 Once they lost the use of their props, the yachts would drift in toward shore, shallow water and the waves would turn them sideways until they were almost beached! Then, some kind people in dinghies would come to their rescue and tow them to the harbor so that they could get their props un-fouled! 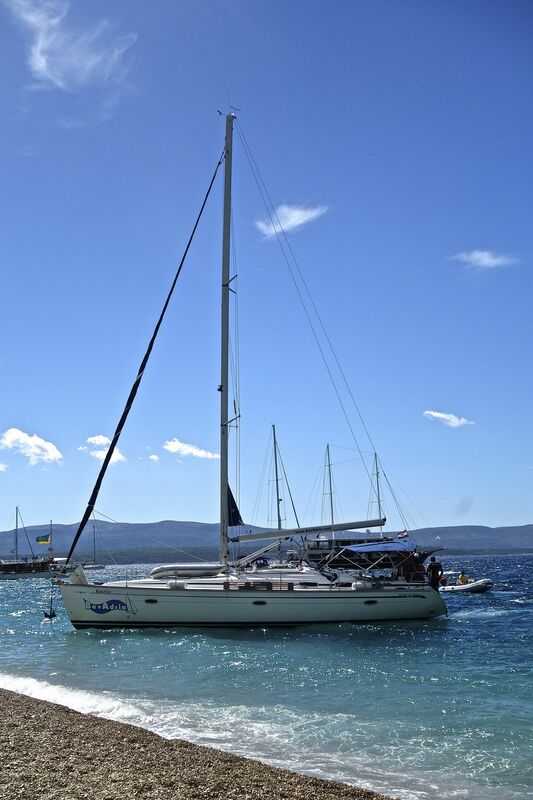 It seemed that no one knew how to properly anchor a yacht. 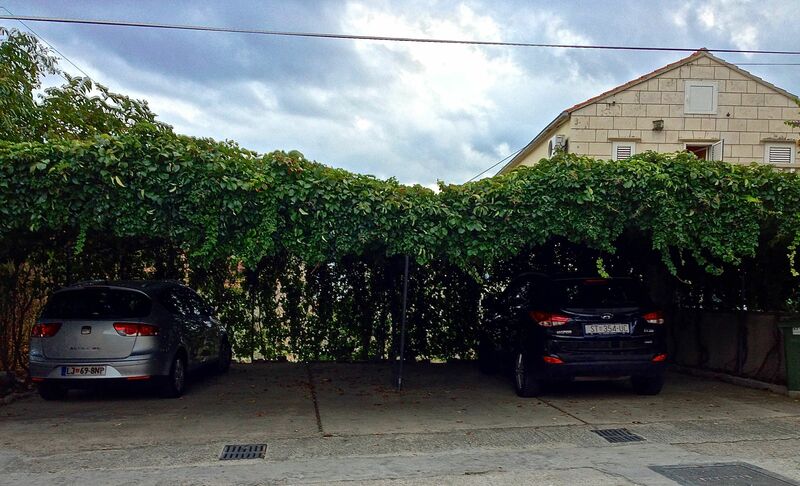 They must have been weekend renters. Reminded me of the sail boating trips Andy and I experienced when we beached our boat on the sands in Ft. Lauderdale and people came off the beach to help us “idiots”. It finally took the US Coast Guard to rescue Andy and me. We last blogged from Munich. 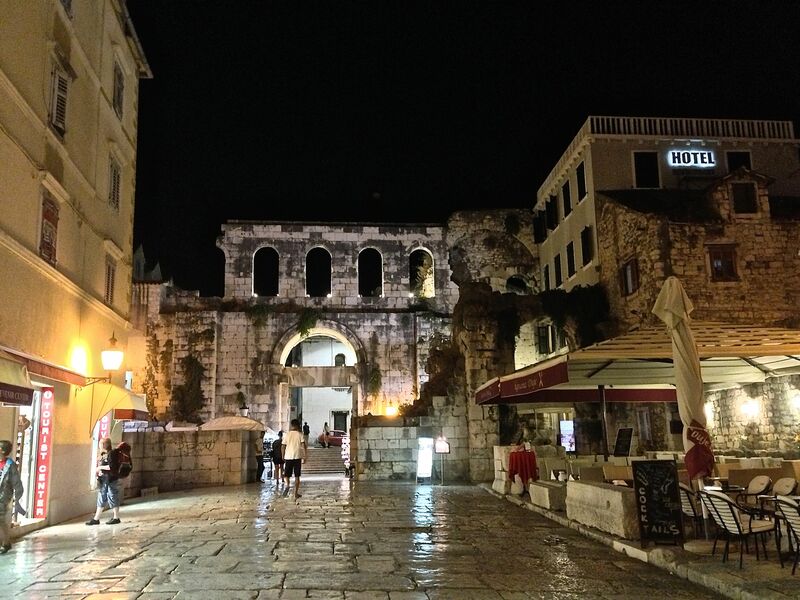 From Munich, we flew to Split. 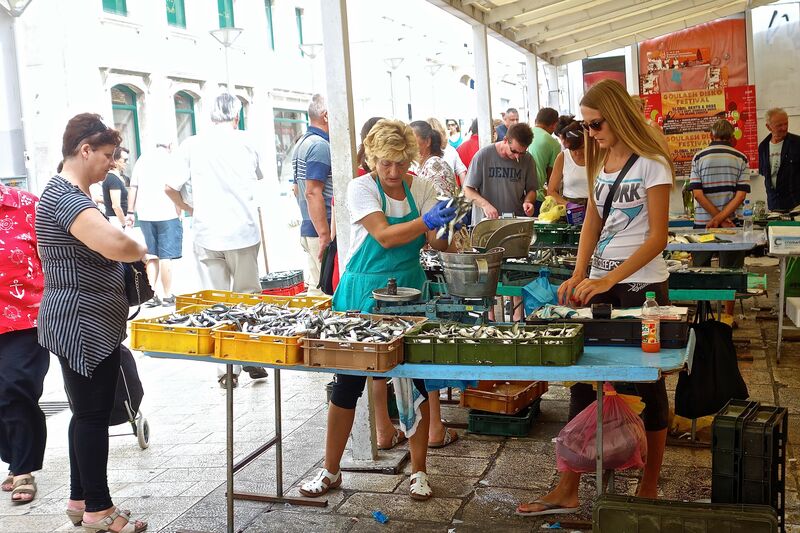 We had planned to use Split as merely as transfer point to Bol, but it turned out to be a very pleasant small town as so many other small towns, Melk, Strausbourg, Rothenburg, Lille, have been. 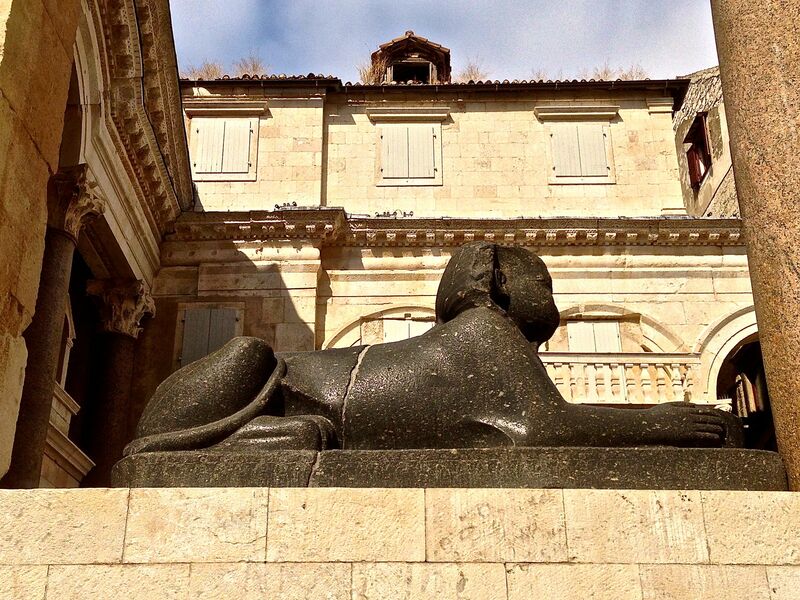 As we walked through Split, we came upon Diocletian’s palace. 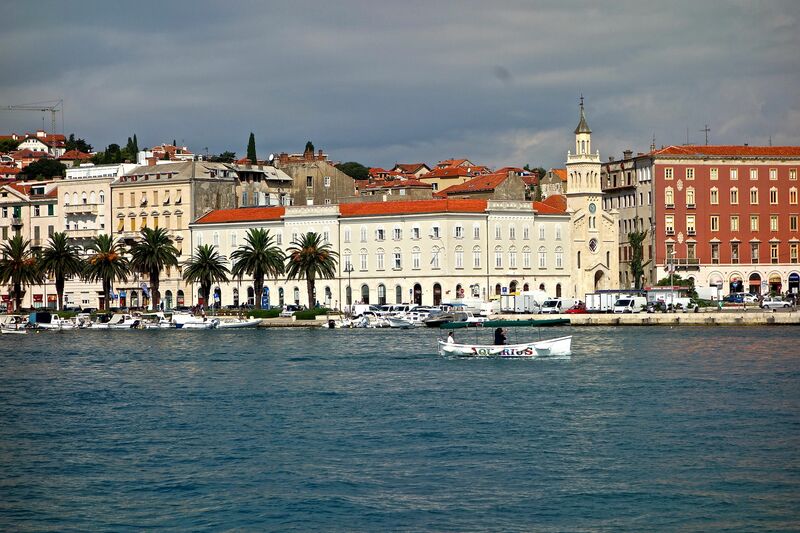 Diocletian was the only emperor of Rome to retire from the “job”. 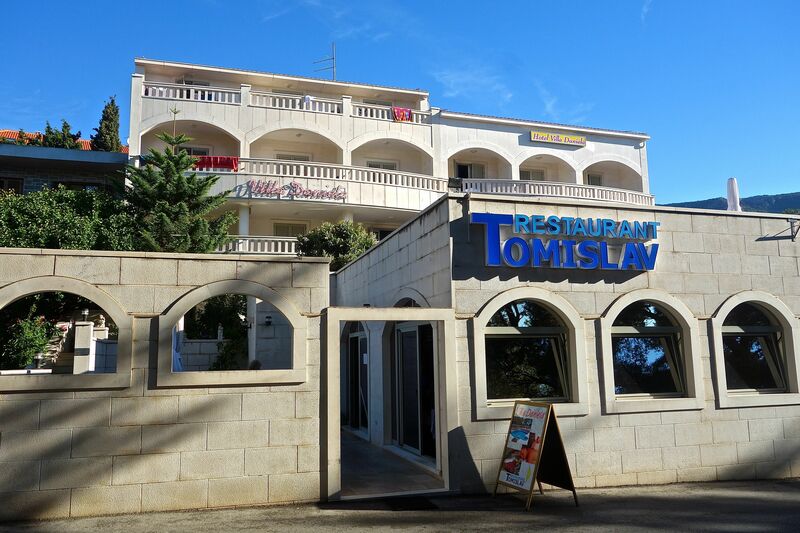 After he “retired”, he went to Split and built a palace. 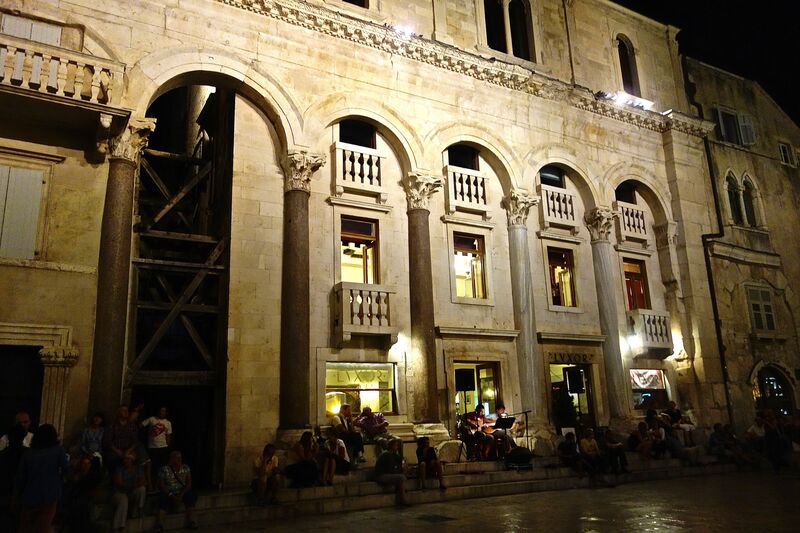 It is the best example of Roman architecture remaining in the world. It has temples, arches, walls, marble, columns, etc. 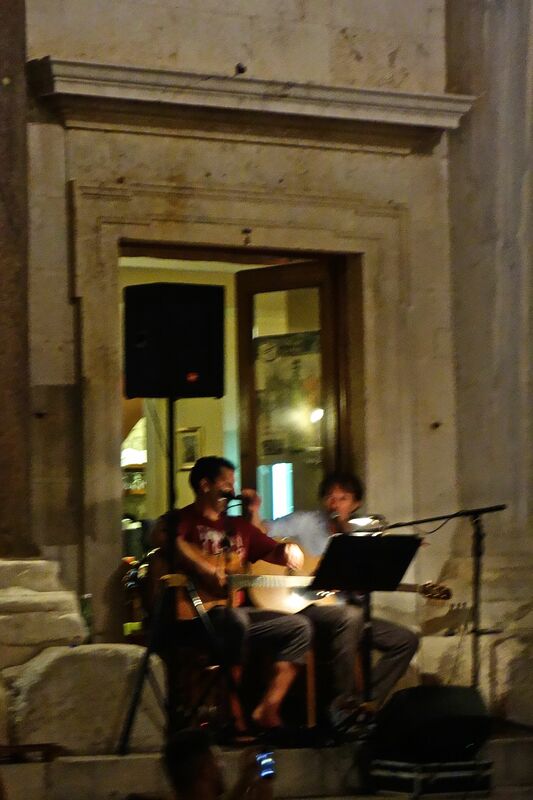 In the open courtyard in the evening, they have some really fine guitarists entertaining the crowd. The courtyard has great acoustics. And, they serve great drinks in the courtyard. 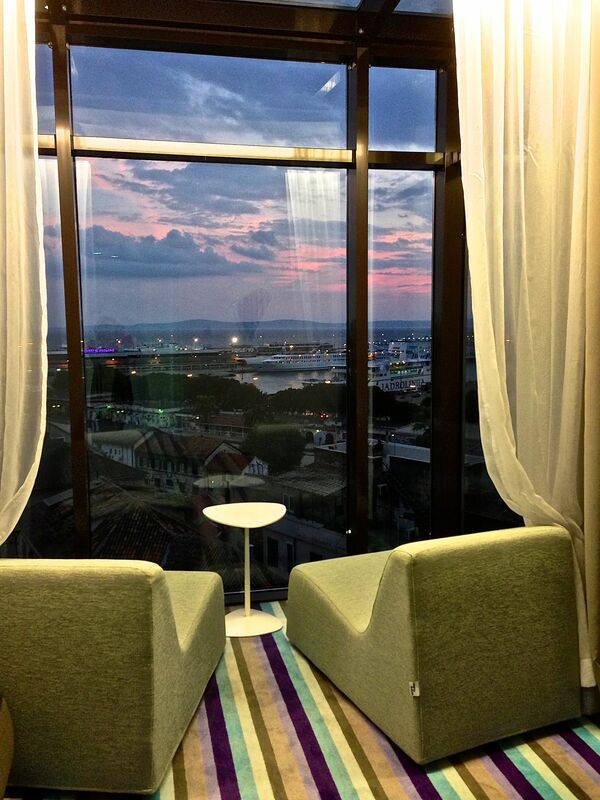 We were very impressed with the beauty of the place and enthralled with the experience. 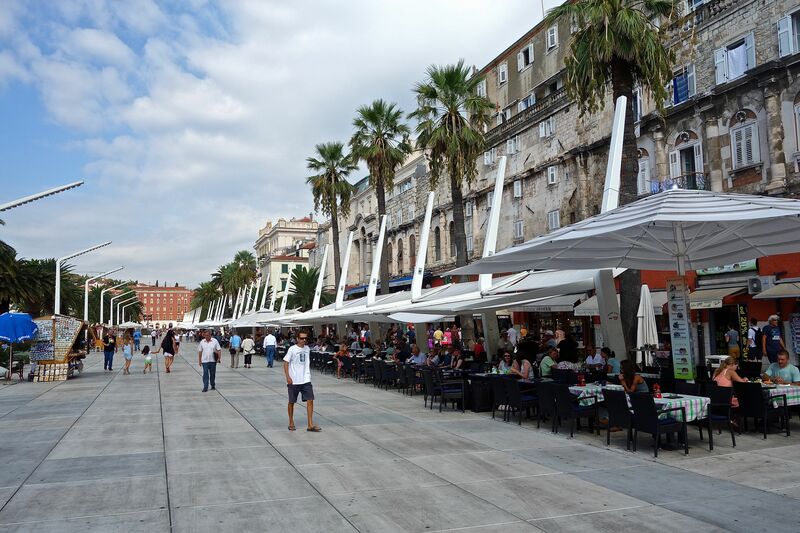 Split also has a beautiful harbor and boardwalk or “riva” along the harbor filled with restaurants, gelato shops and palm trees. 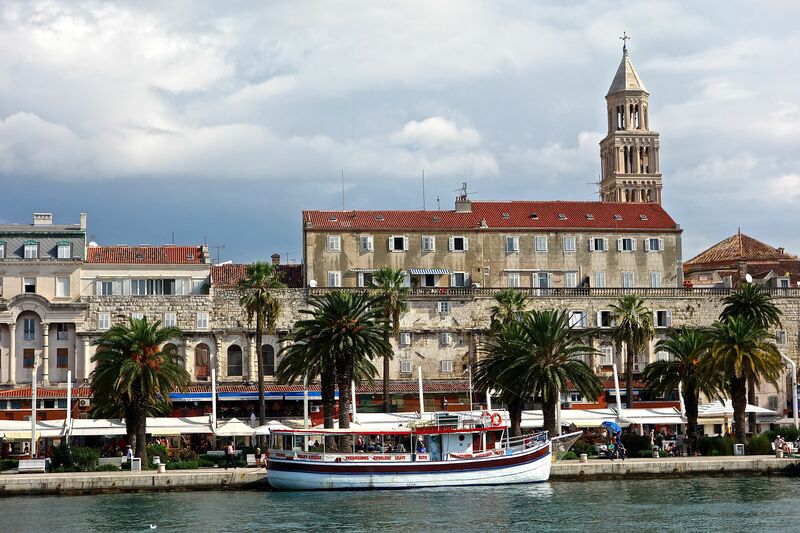 The warmth and beauty of Split helped us ease the pain of moving from our car travels, and leaving Betsy behind, to plane and ferry travels. 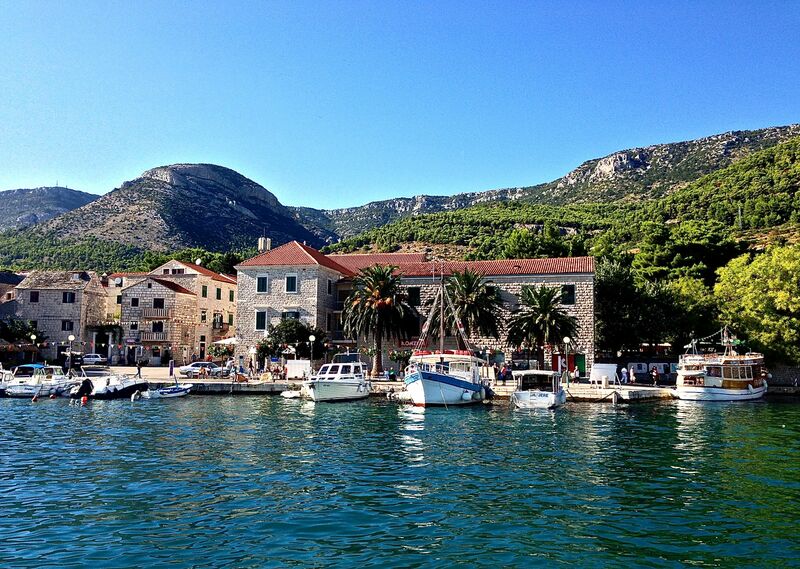 Next stop Hvar. We will let you know if we run into Brad or Beyonce. 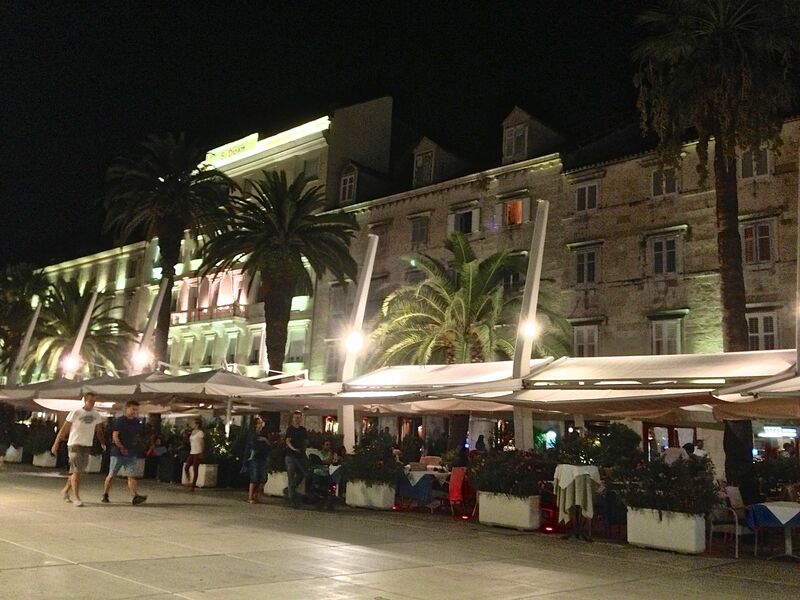 Hope you enjoy these pictures of Split, Croatia, we sure loved our time there. 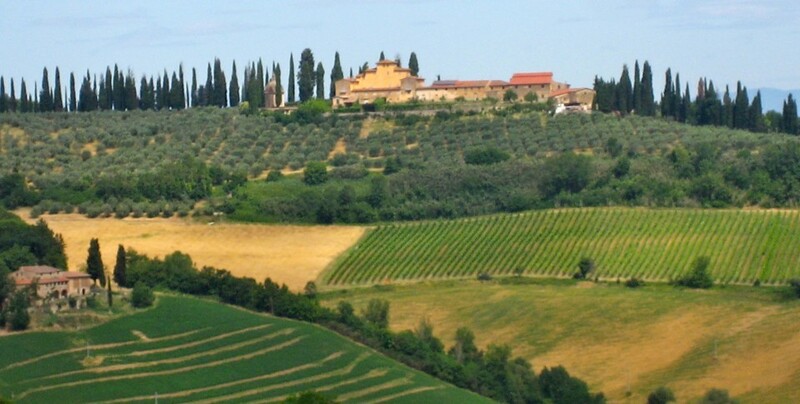 We are trying a new way of uploading and updating our web page so we’ll see if this is any better. Let us know if this is NOT still simple to follow! THANKS! Thought we’d sit here and ponder what to do the next day! 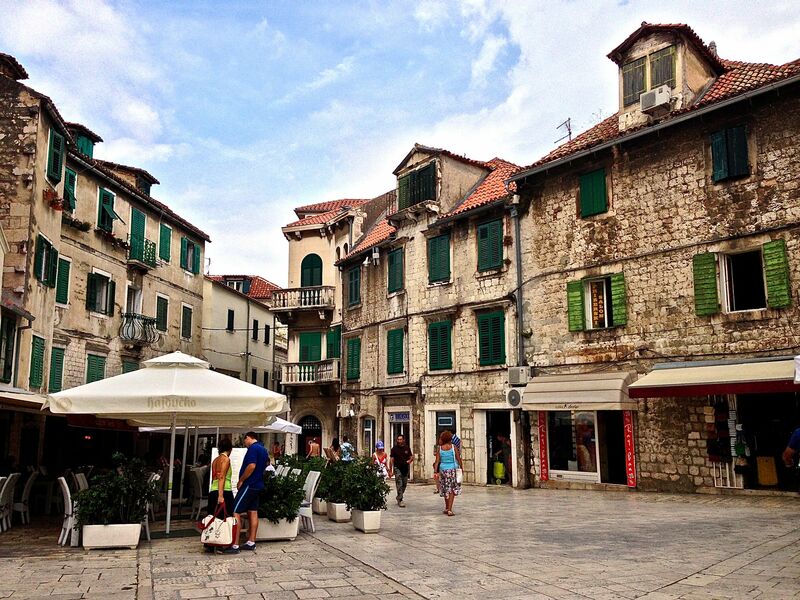 Just a simple corner street inside the Diocletian’s Palace. 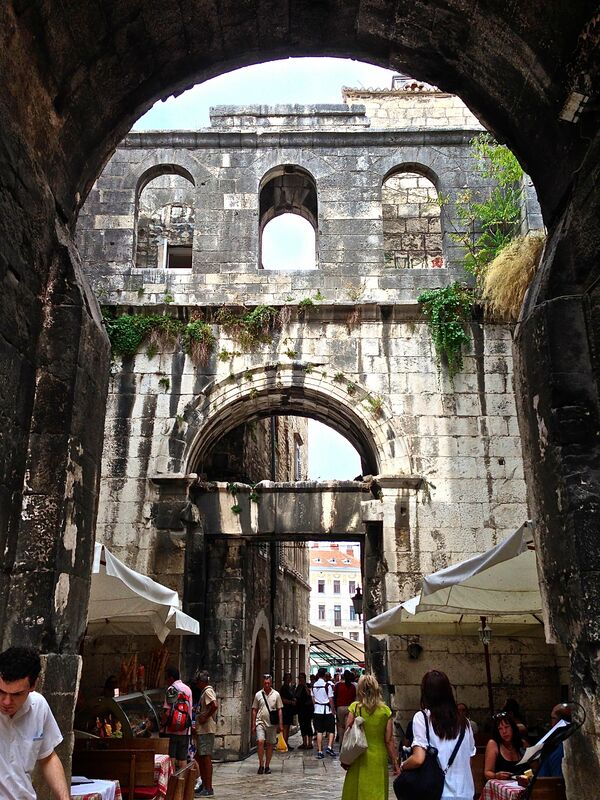 One of the entrances to the Diocletian’s Palace grounds, yes this hotel sign is inside the “grounds”. 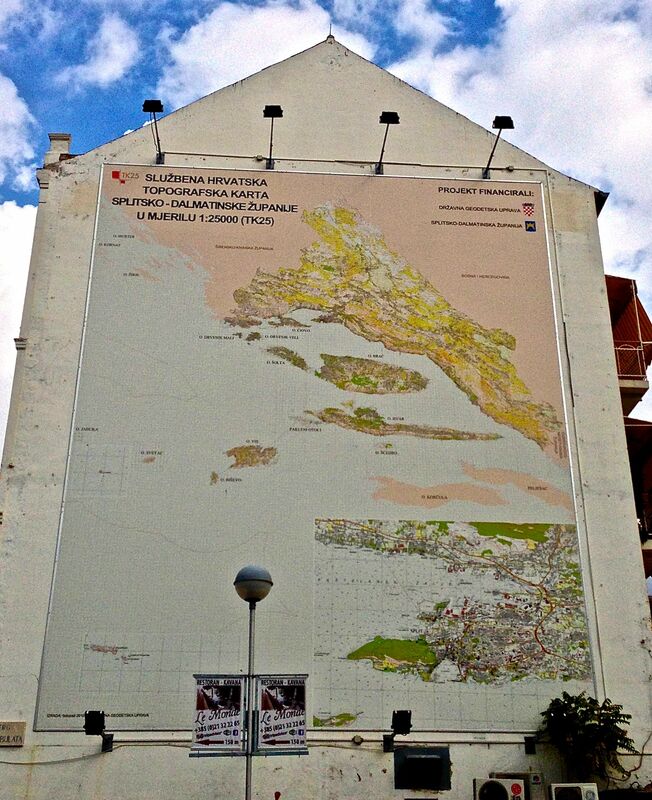 Just in case you don’t know where Split, Croatia is, enlarge this and take a look at this map. 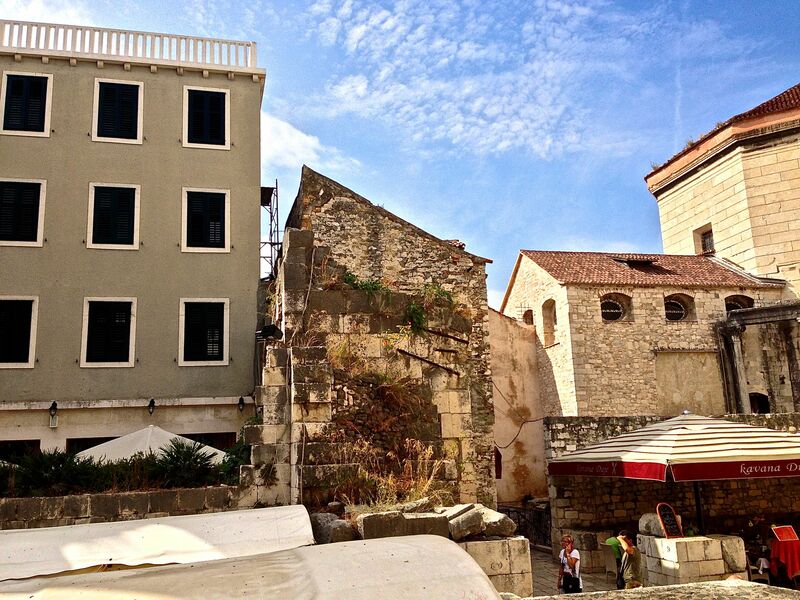 Just amazing to us that this is still standing and people live and work inside of these walls. 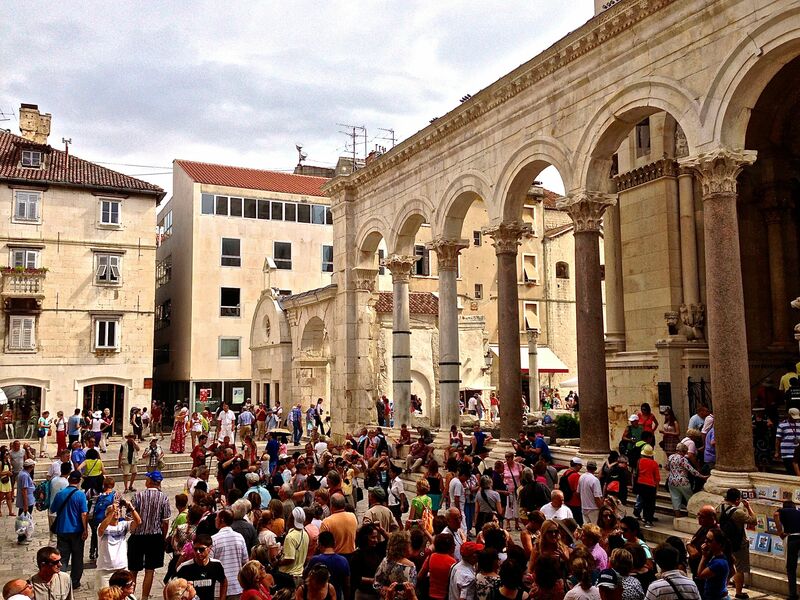 One of the Squares inside where people like to gather. This lion is one of the two originals built in 305, amazing that it only has a crack in it after almost 2000 years old. The middle structure you see here is the original wall, that is how thick most of the walls are. The corner street during the day. So nice! The streets are all marble. 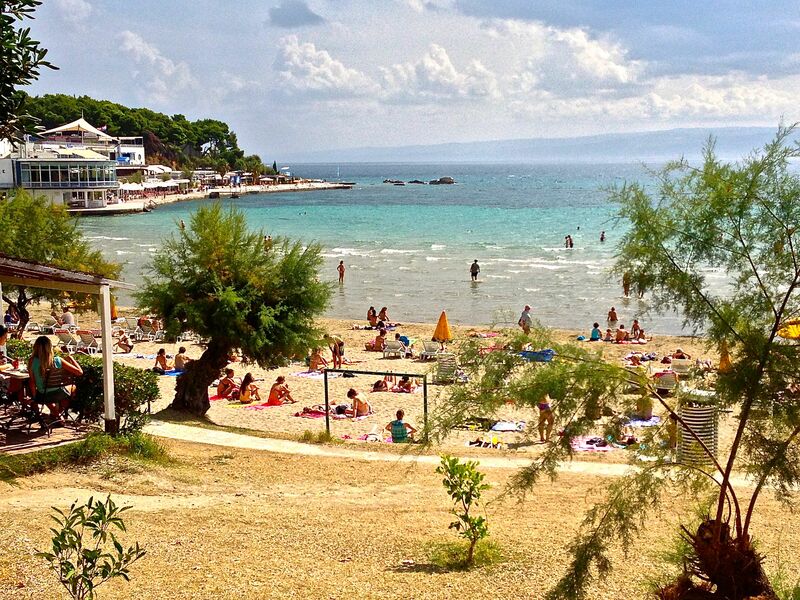 Another beach in Split, for those of you who like to be on the “Edge”! 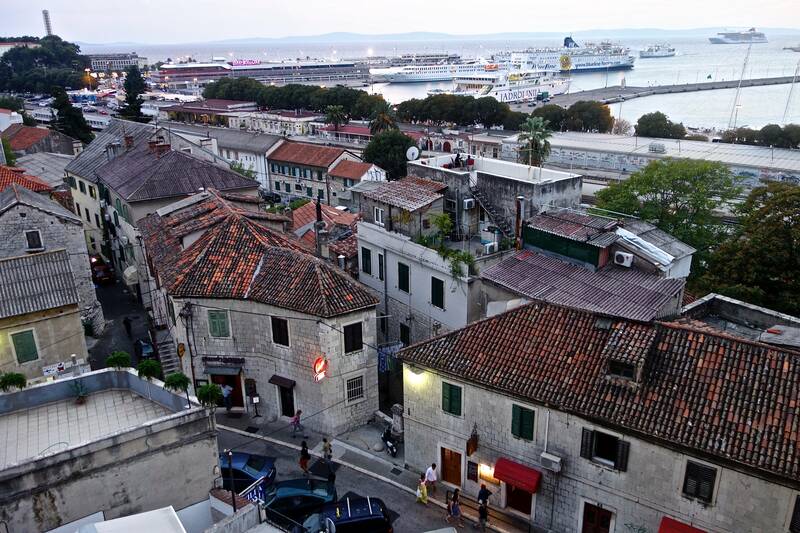 View of Split rooftops, everyone uses the patios. 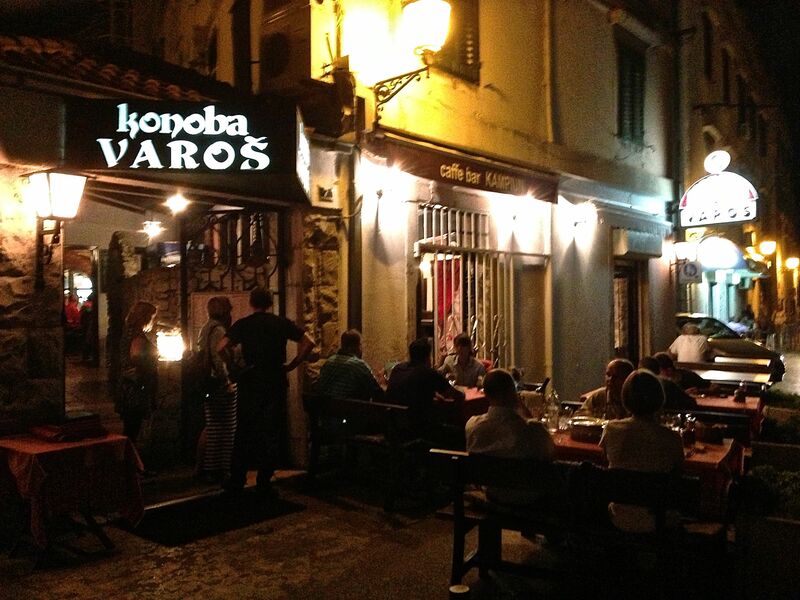 Here is where we were entertained by the two guitarists! Pretty cool, Heh? They just sit and play to the people at night! 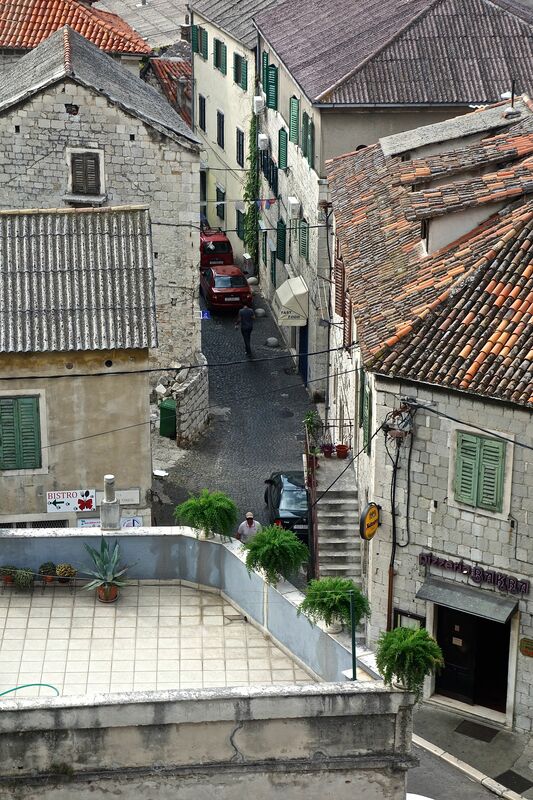 See how narrow the streets are? 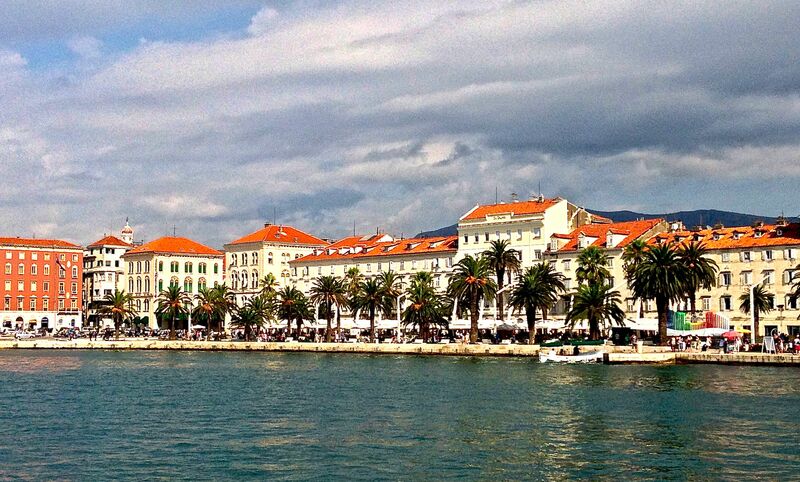 Beautiful view of Split from the pier. 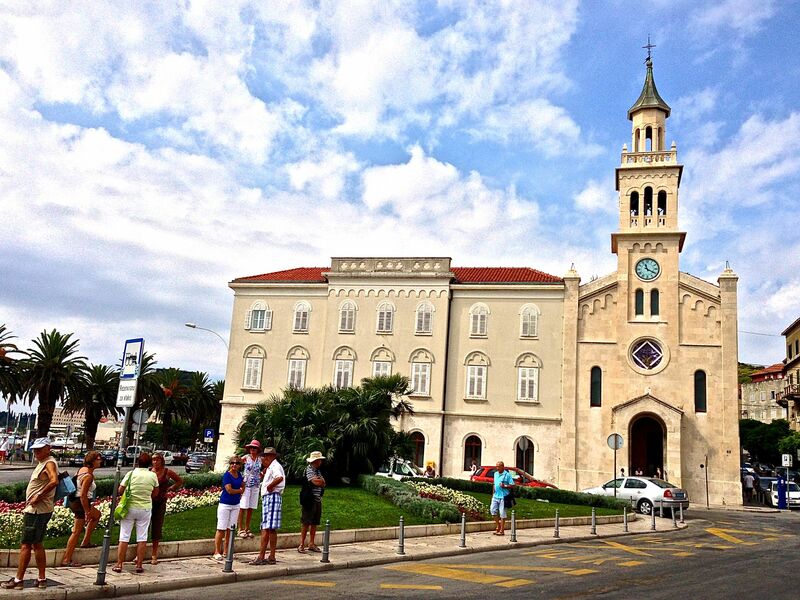 The church in the background is inside the Diocletian’s Palace. 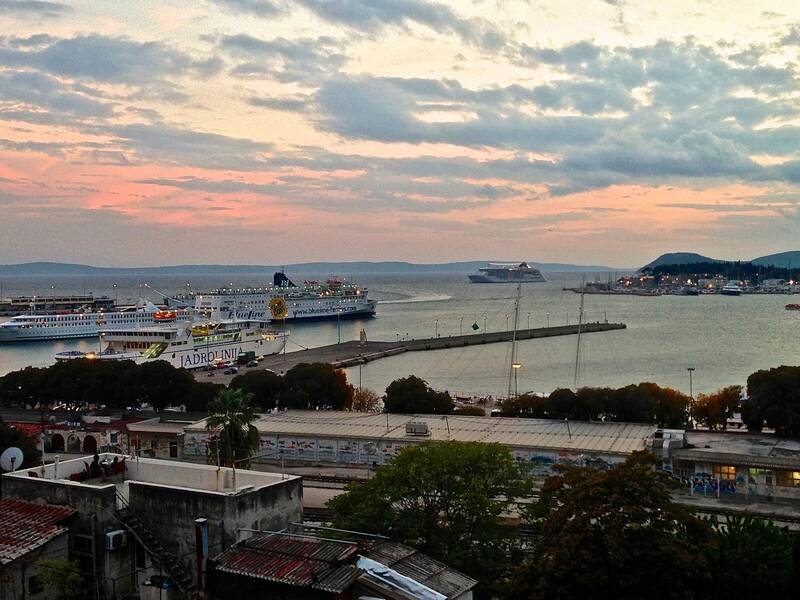 Different view of the Promenade during the day. YEP!!!! 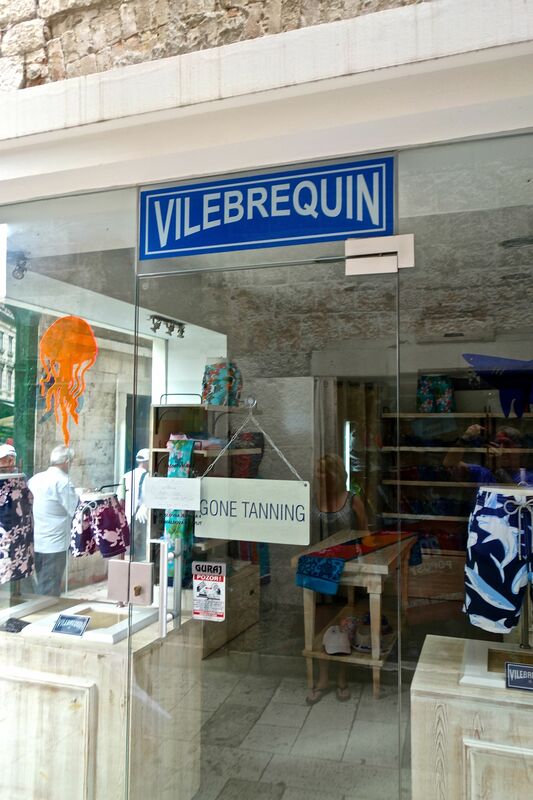 They have “GONE TANNING”! Looks like sand, but it is tiny pebbles. 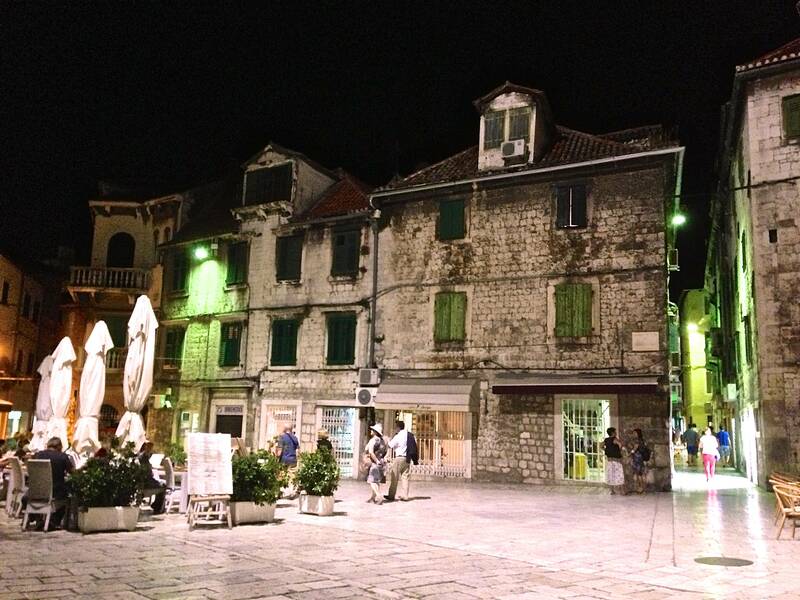 Just loved walking this at night, cool breeze in the air…. 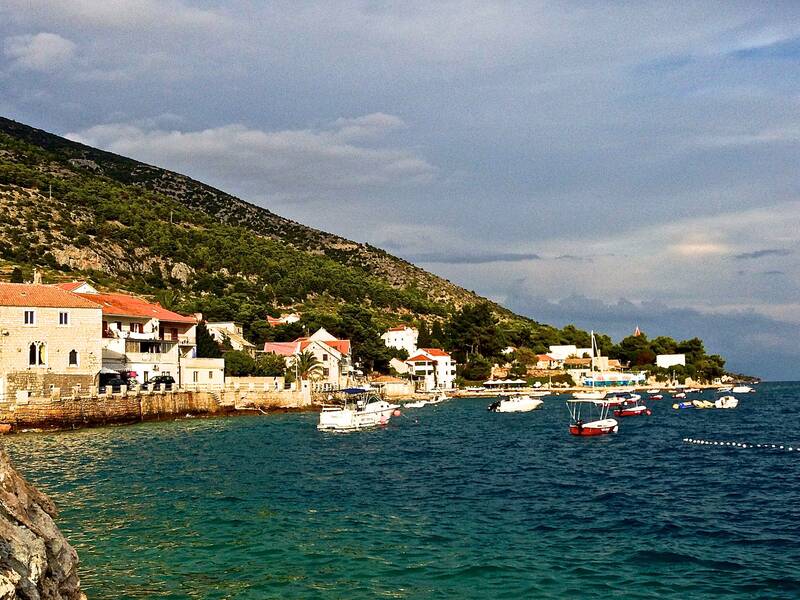 Now here are some of Bol, Croatia! 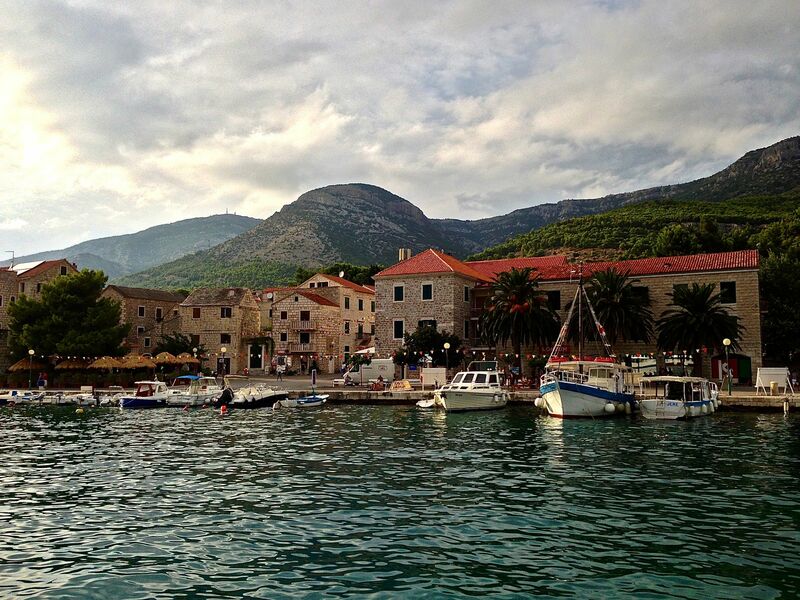 Our first sight of Bol, Croatia after getting off the ferry. AHH… the opposite side of the pier when pulling in off the ferry. Took a little walk and whoah.. these people are what we call “GREEN”! 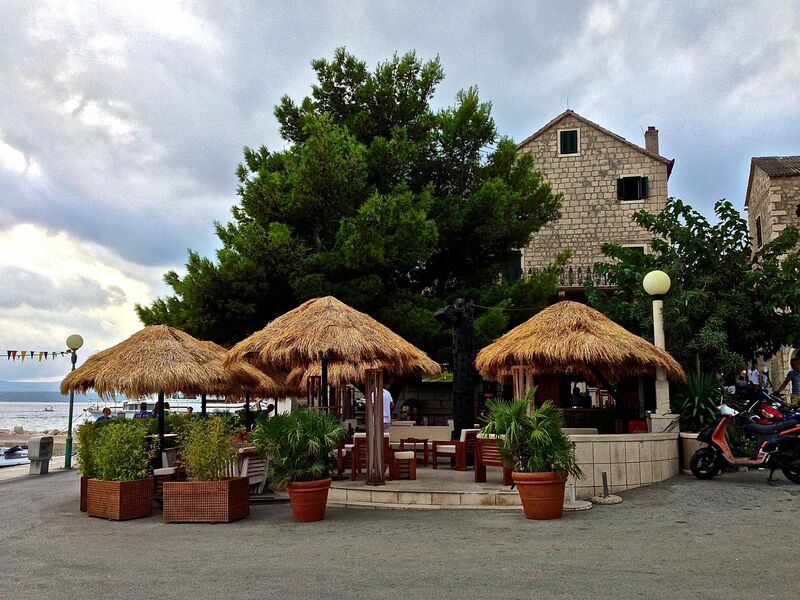 Found this nice thatched roof bar…. 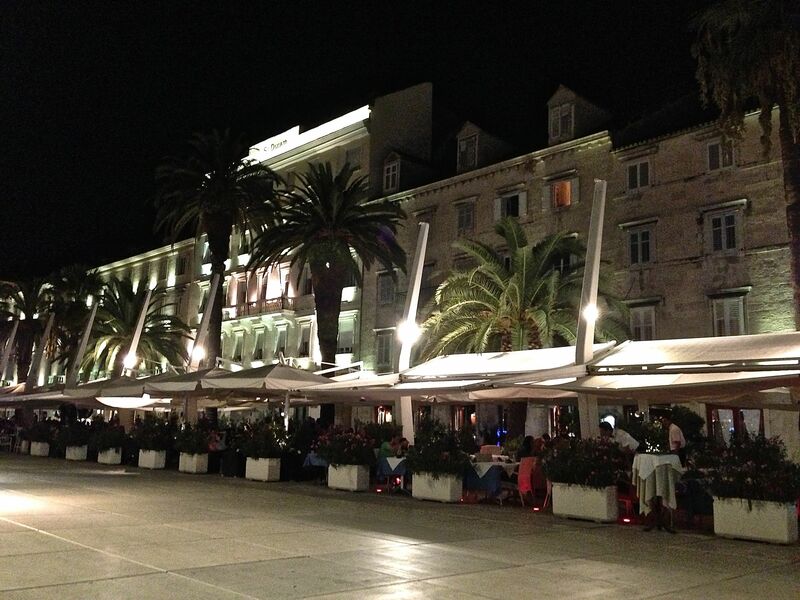 We definitely had some great cocktails here ! 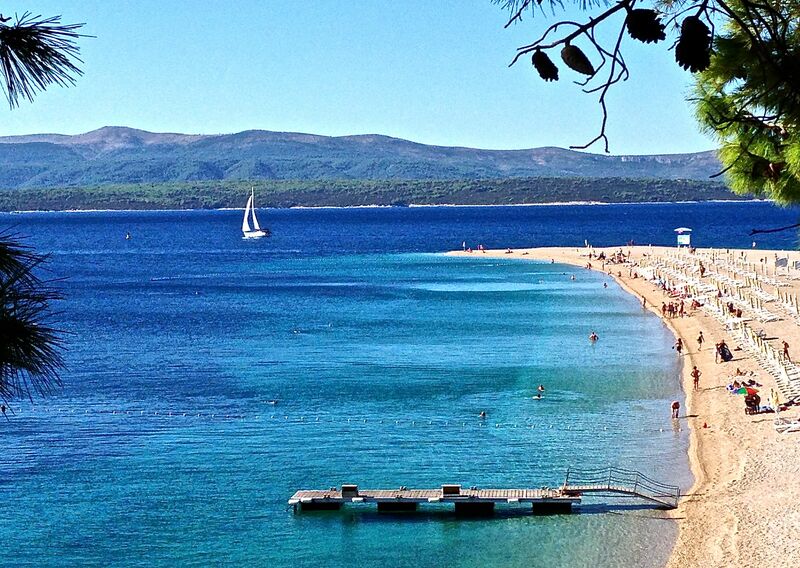 This is what we saw as we were walking to our famous Zlatni Rat beach! Oh, yes, this is going to be my new wallpaper on my computer! Here’s our beach we’re looking for! 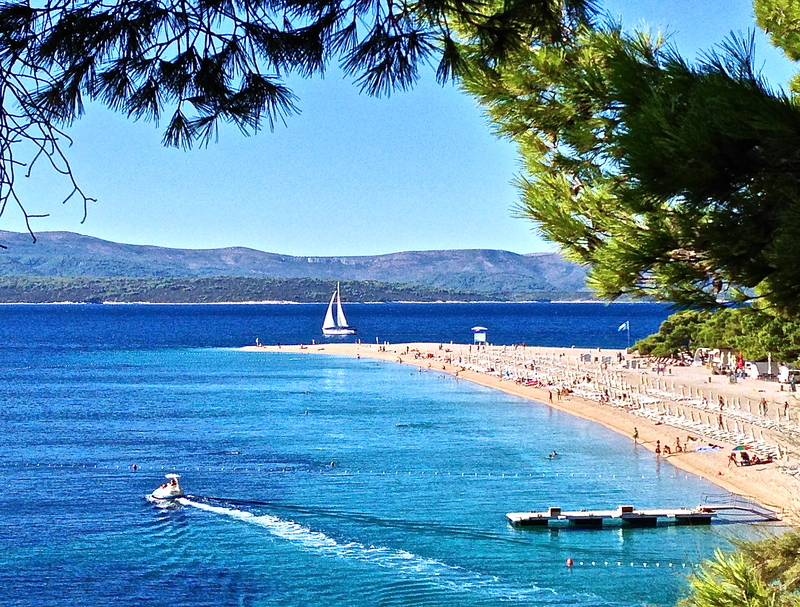 The very tip of Zlatni Rat beach from our angle. This is where we landed! Took this from my beach chair! Loved watching the colors all day. 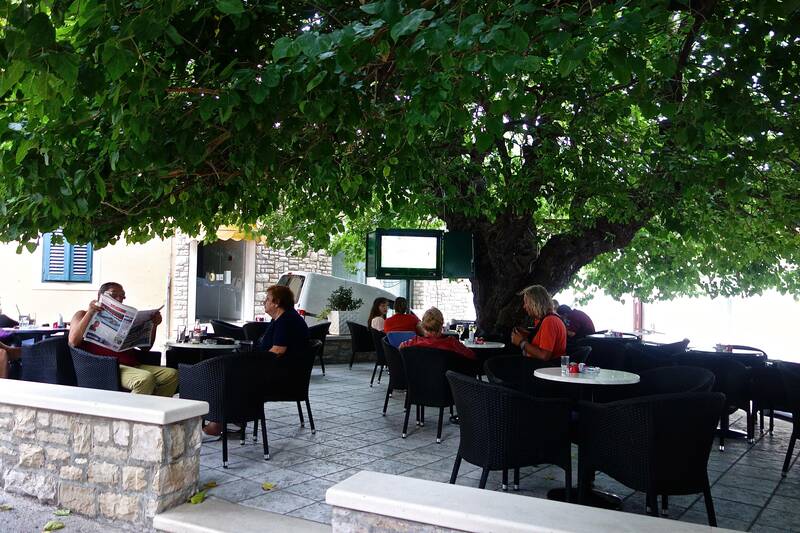 Oh, my, another place to have drinks outside, and with a TV screen in the trees! Bol street, this one is exceptionally wide! 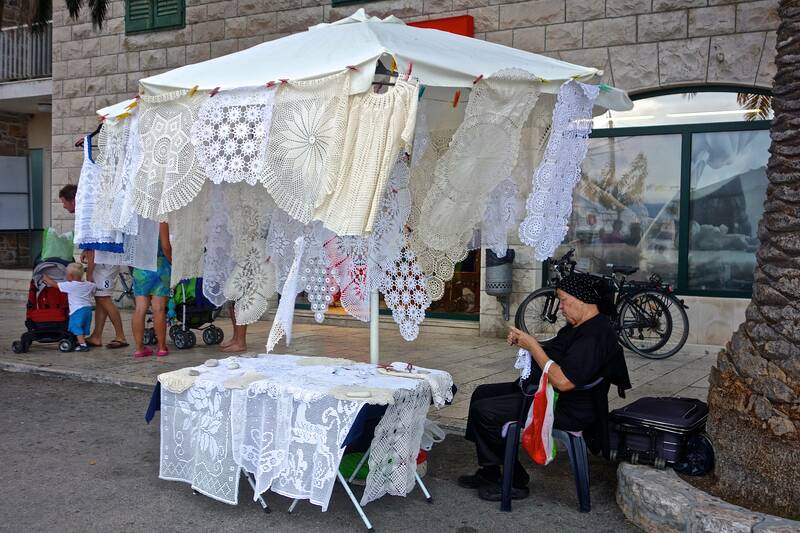 Anyone need any doilies? table runners? tops? Our villa, we stayed in the room just under where the towel is hanging from the top floor balcony! 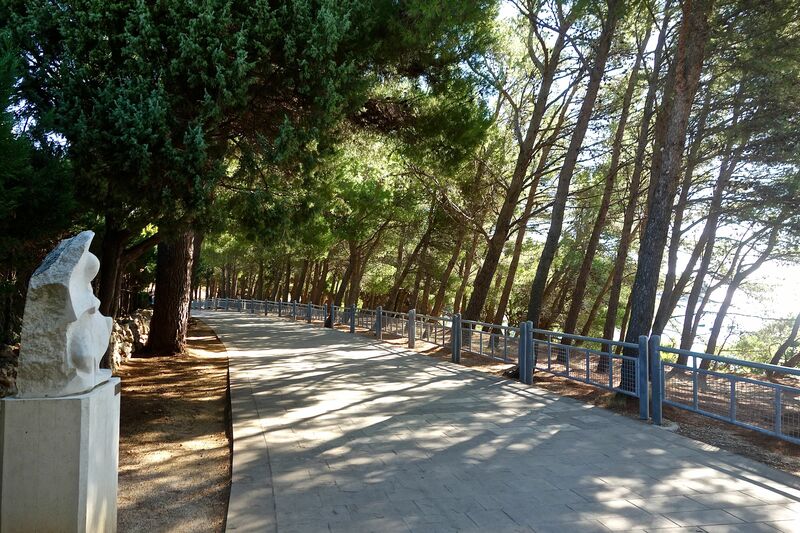 This path is what we walked along to get to the beach. 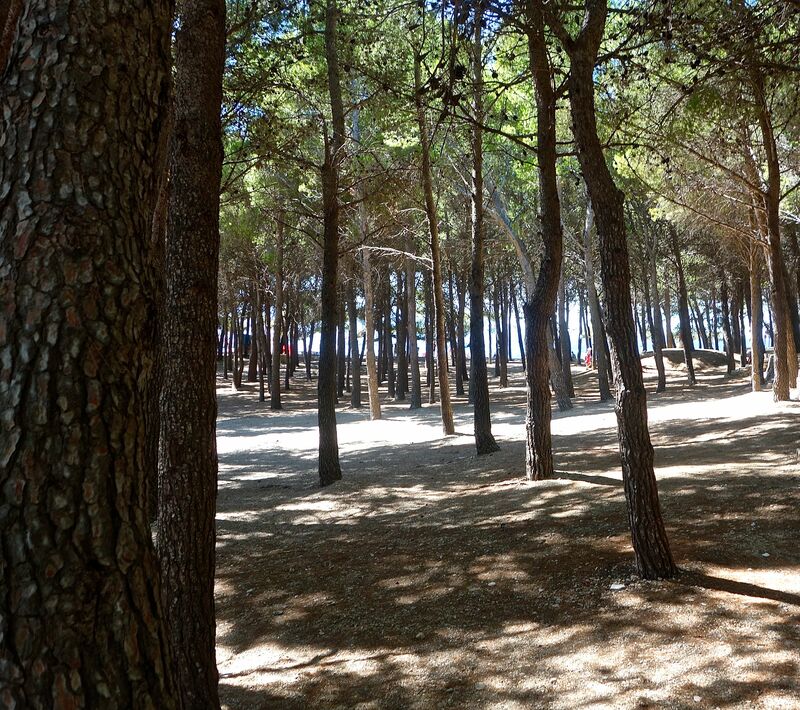 Very nice shaded path all the way. Our rules just before entering the beach area! Dummies that were trying for two hours to dock this boat with an anchor just outside our swimming area! We weren’t the only ones that thought these guys were dumb or inexperienced!! Every one came down to take a picture, b/c they had to be towed! This is the shaded area that has all the vendors, pretty nice place. This is the bar that serves drinks only at the beach, the vendor behind this serves sandwiches, the vendor behind that serves french fries, and the vendor behind the french fry guy serves ice cream. But you can bring all your food here to eat under the shade trees and order drinks! Posted on September 13, 2013 by rita8384	• Bookmark the permalink. What beautiful colors of the sea!!! OMG!! THAT WATER!!! How beautiful!! And, no sand?? 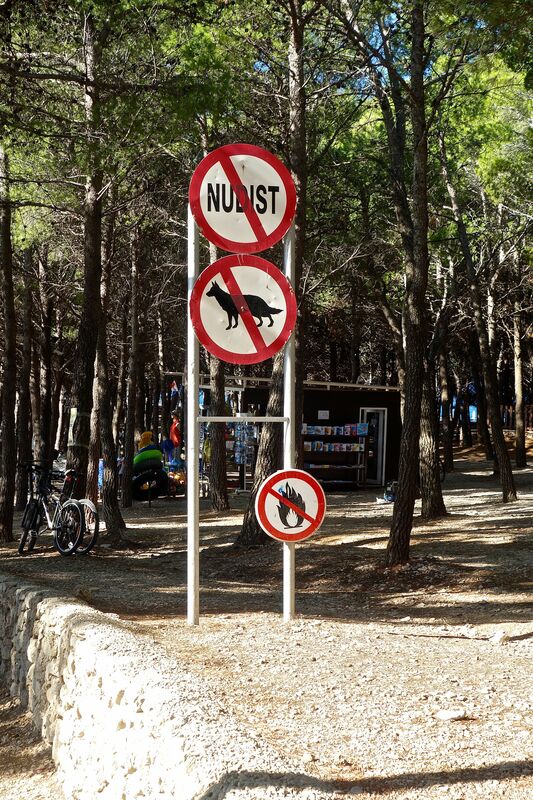 Must be my favorite beach ever! what an amazing journey you are on, I am so happy for both of you. God has made everything beautiful in its splendor, and you are fortunate to see with your own eyes his masterpieces. Embrace it all, cherish your time together and have a glass of wine for me.